This is a fabulous book, and a real education too - a beautiful introduction to hands-on chemistry. Theo Gray brings us dozens of experiments in minute, clear, and loving detail, and each one becomes a door onto the marvels of how chemicals react. Whether he is showing us how to make table salt from its violent elements, or, in a quieter vein, to make one's own nylon thread or "lead" pencils, Gray's encyclopedic knowledge and contagious enthusiasm transport us to deep intellectual realms, while never sacrificing a sense of wonder and, above all, fun. What good is this Nobel Prize around my neck if it doesn't produce admiration for science writers such as Theo Gray, whose skillful work helps convert young students into serious researchers. What a magnificent book. It's gorgeous, playful, and draws you in. Every single photo shows not only a deep love of science in the abstract, but also a tinkerer's love of the STUFF of science; the tools and glass, the clay and metal, and all the things that make science accessible to everyone. hat happens when you blow pure chlorine gas into a bowlful of molten sodium? A fire, that�s what. But the smoke coming off of that fire happens to be extremely fresh common table salt (NaCl, sodium chloride) that can be used to salt a net full of popcorn suspended over the flame. That is, until the net melts and the popcorn drops into the bowl sending a shower of flaming liquid sodium balls in all directions! 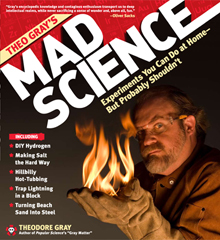 In Mad Science Theodore Gray reveals how to demonstrate scientific principals through extreme experiments. He launches a toy rocket using the energy released from an Oreo cookie, ignites a �phosphorous sun� by suspending half a gram of white phosphorus in a globe filled with pure oxygen, whips up a batch of homemade nylon thread by linking the molecules of hexamethylenediamine and sebacoyl chloride, and gets the party started by adding 500 pounds of quicklime to water to create a homemade hot tub. 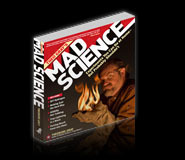 Every experiment in Mad Science is accompanied by stunning full-color photographs that provide a front-row seat to split-second chemical reactions and glorious subatomic activity. To further enhance the hands-on experience of scientific exploration, Gray includes step-by-step instructions for nearly every experiment. Following all of the safety guidelines, readers can safely recreate some of the fifty-five experiments in the book including making sinking ice cubes, building sodium acetate sculptures, and burning steel. Other experiments, such as igniting liquid oxygen drops or turning beach sand to steel, would be just plain crazy to attempt without the aid of an experienced chemist or someone who has performed the experiment successfully before.